British composer John Tavener has died at the age of 69. Sir John Tavener, one of the leading British composers of the past 50 years, was known for music that drew on his deep spirituality. In 1992, The Protecting Veil topped the classical charts for several months and in 1997 John Tavener’s Song For Athene was played at the funeral of Princess Diana. John Tavener had suffered ill health for much of his life, including a major heart attack in 2007. He died at his home in Child Okeford, Dorset, on Tuesday. He made his name with the avant-garde oratorio The Whale, which was released by The Beatles on their Apple label in 1968. John Tavener went on to become one of the few contemporary composers to find wide acclaim beyond the classical world. His other well-known works included his setting of William Blake’s poem The Lamb and A New Beginning, which was chosen to see in the new century at the end of 1999 in the Millennium Dome in London. John Tavener was nominated for the prestigious Mercury Prize twice – in 1992 and 1997 – and was knighted in 2000. Having started his musical career as a teenage organist at a Presbyterian church in London, John Tavener converted to the Russian Orthodox Church in 1977 and once said that “my way towards God has been to write music”. John Tavener was also known for his imposing 6ft 6in frame and his flowing hair. As well as music, one of his great passions was luxury cars. He had suffered a stroke in 1979, and in 1990 was diagnosed with Marfan Syndrome, a hereditary condition that can cause heart defects. In 2007, John Tavener suffered a heart attack that caused him to spend six months in intensive care. 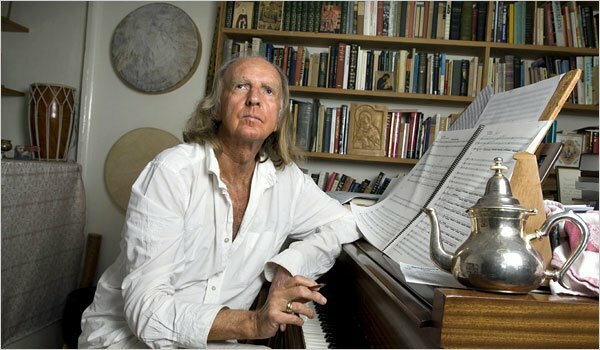 John Tavener defied doctors who did not expect him to return to work, and in his last months described composing as a welcome distraction from constant pain.